A few days ago I attended a Birkbeck Food Group event with one of my food heroes, Claudia Roden. 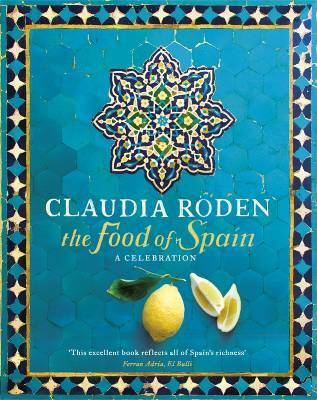 It took Claudia 5 years to research her most recent book The Food of Spain. Sixty minutes was never going to be enough for this whistle-stop tour of the country in its cuisine. Each visit Claudia made to Spain unearthed more food memories than she could have hoped for. Each contact came up with yet another person to meet. She would talk food favourites, festivals and folk history in kitchens as "people open up in the kitchen, not in the living room". Most, be they workers or nobility, spoke of peasant cuisine being central to their food memories. Claudia's thesis is that Spain's history of conquering armies meant a population on the move and tastes were, by necessity, unsophisticated. The aristocrats despised vegetables and ate meats, mostly game, though rabbits were left to the lower orders. In Bourbon and Habsburg times the Spanish nobility ate French cuisine. They followed the lead of King Philip V who employed cooks trained in the French court at Versailles. The current haute cuisine in Spain, she was assured, was a cuisine of "today", though chefs claim to look to the roots of Spanish food for inspiration. A quote from the Catalan writer Josep Pia "A country's cuisine is its landscape in a cooking pot" was apt. The diversity of the landscape of Spain has led to three styles of cooking: the sea; the plain; and, the mountains. Claudia pointed out that, unlike Italy, dishes are not contained within regional borders. The food of the wet, mountainous north was influenced by early French pilgrims walking the pathways of St. James, and by the maize, potatoes, beans and peppers brought back from South America by returning priests. The Visigoths introduced cider apples and pigs leading to dishes such as the Asturian roast pork with apples and cider. The ebb and flow of religious intolerance can be seen in the foods of Jews who arrived in northern Spain to escape the rule of the Berbers in the 12-13th centuries. To Claudia's mind, the famous Tarta di Santiago is a good example. In this sweet dish of almonds, eggs, sugar, butter and citrus she can see the Jewish Passover cake. The hot, interior Plain was perfect for ranching and pastoral farming, feeding the rich on roast meats and the poor on "spoon" dishes. After 1492, the Moriscos (Muslims forced to convert to Christianity) remained in the region until the 17th century leaving a legacy of Moorish dishes which we learnt exceeded that of Andalucia. The fried breadcrumb dish 'migas', now widespread in Spain, came about when the Moors were banned from eating couscous. The coast and Balearic Islands shared the mild climate and cuisine of other Mediterranean countries. In Cordoba, on the the Route de Caliphate, Claudia had enjoyed aubergine soaked in milk, floured, fried and drizzled with honey. Having eaten a very similar dish in Morocco, it was difficult to argue its origins did not lie in Moorish rule. Later, Catalans re-populated these Arab-taken areas and brought their cuisine to the mix. As in many European countries, the monasteries were famous for the quality of their cooking and in the convents pastries were baked for benefactors. Attempting to extract recipes, Claudia was frustrated to find the convent visited was that of a ‘closed order’, with only Sister Immaculata having dispensation to speak. This significant problem was later resolved by an unintended invitation to the Sisters to become Friends on Facebook where they happily 'conversed'. Here is the recipe for Claudia Roden's version of that Tarta de Santiago almond cake. Grease a spring-form cake tin, around 28cm in diameter (preferably non-stick) with butter and dust with flour. Preheat the oven to 180C/gas 4. Grind the almonds finely in a food processor. Beat the egg yolks with the sugar to a pale cream then best in the orange and lemon zest and almond extract. Add the ground almonds and mix very well. Whisk the egg whites until stiff and fold gently into the egg yolk and almond mixture. Pour the mixture into the prepared tin, smoothing the top. Bake in the oven for 40 minutes or until it feels firm. Cool then turn out. Dust the top with icing sugar - if you like, cut the shape of a Santiago cross out of the paper and place it in the middle of the cake first, then carefully remove the paper shape.